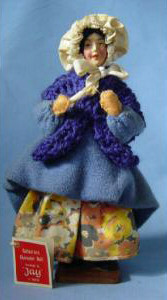 Jay of Dublin made dolls that were very much in the tradition of Shallowpool dolls. They were 8" tall, with a hand-painted plaster face, felt hands, and a padded cloth body supported on a wire frame or armature. The faces are particularly interesting, being cleverly modelled, and and beautifully painted. 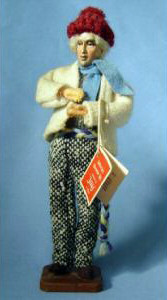 Each doll had a red "book" tag, with the words, "Collectors Character Doll handmade by "Jay" of Dublin" tied to its left wrist. 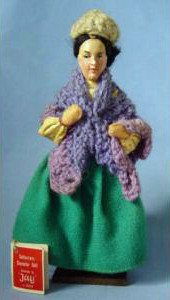 One distinguishing feature that set them apart from Nisbet dolls was that they were nearly always mounted on a square wooden base. As far as we can determine, the characters were all drawn from the counties of Ireland, and depicted the diverse inhabitants and their equally diverse occupations. These wonderfully varied and interesting dolls can be found at numerous websites on the internet, and while we can offer a few poor quality images here, a quick websearch will reveal a treasure trove of pictures for further study. Jay dolls are beautifully charming creations, with character and personality, and should the Nisbet collector find one in their collection, we think that they should treasure it!